Last week I made a bracelet that I totally love. It featured hardware store chain and I’ve got to tell you… I’ve worn that silly thing while cleaning house, crafting, you name it. Plain and simple… I love it. Today I made another braceleet with hardware store chain as promised. Before I started I was pretty darn sure that I wasn’t going to be able to best my previous attempt. I think that I just might have been wrong. 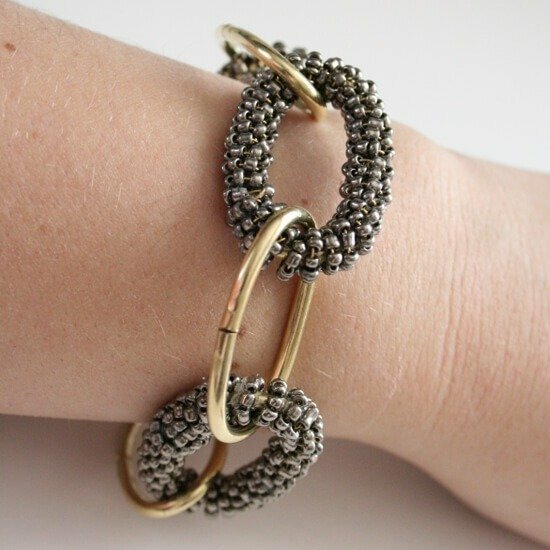 I love, love, love this bracelet. So, so, so much. In fact, I’m unable to say anything intelligent about it so let’s just get on with the DIY already. First cut your chain to work to go around your wrist. When you add the beads, it is actually going to shrink up a bit. While 5 links went around my wrist pretty perfectly, 6 is what I needed to use so that it would fit in the end. Cut a length of wire that is about 1.5 feet long. Wrap the wire around the first link as shown above. 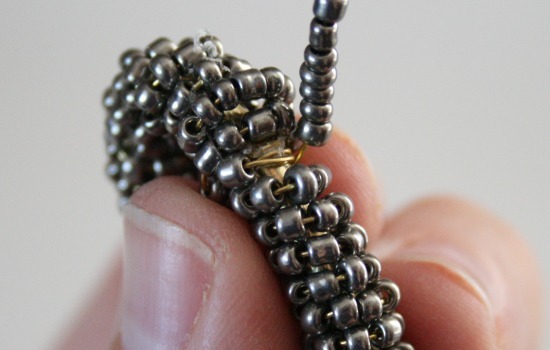 Start stringing on your seed beads until you have a good 6-7 inches on the wire. Hold the wire tight and wrap around the link. 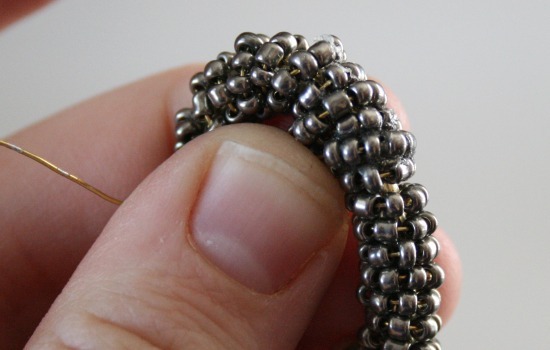 You will need to push the beads up on the wire while wrapping to prevent any gaps. It’s hard to explain but when you start wrapping you’ll get what I’m stepping in. 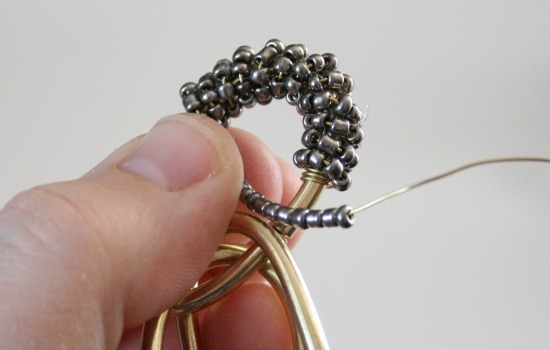 Continue around the link adding beads as needed to the wire and coiling as tightly as you can. When you get to the end, you’ll run up to the first bead on the wire. 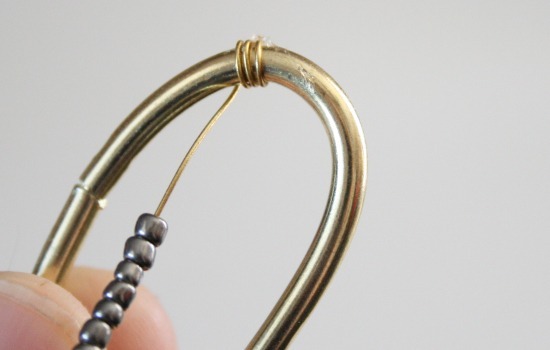 Place a healthy daub of strong glue, like E-6000, in the area ahead of your first bead. 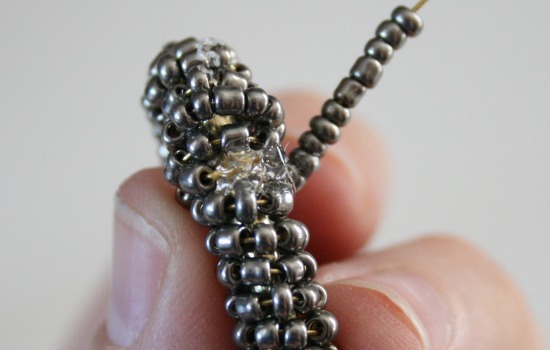 Push the wire and beads into the area with glue. You will have a few extra beads and a couple of inches left, but nevermind that. Hold tight until the glue sets well enough that you an set it to the side until fully dry. Trim the excess wire holding on so the extra beads do not fly everywhere. Continue the process for every other link in the chain. Finish by attaching jump rings and a lobster clasp to one side. 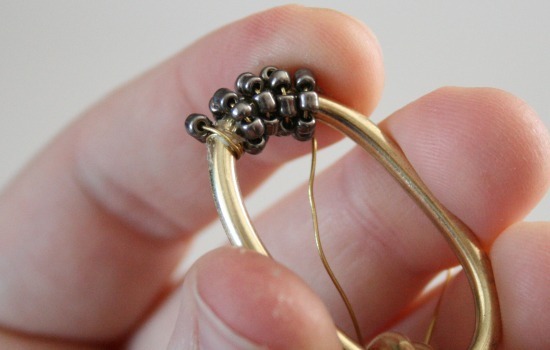 Use as many jump rings as needed to extend the size to be comfortable when worn. 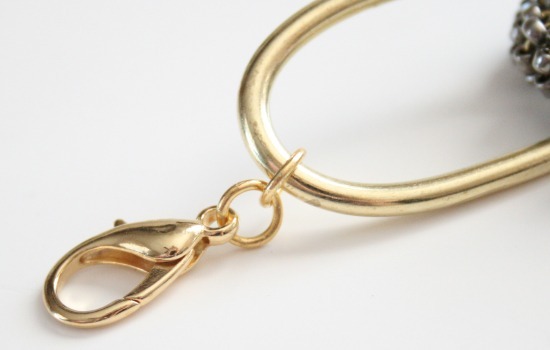 To put on, connect the lobster clasp with the first link in the chain. Right now I’m totally digging gray and gold together, but do the colors that suit your taste. I’m thinking white with gold, black and silver, blue and silver – the options are only limited by the color of chain you can get. 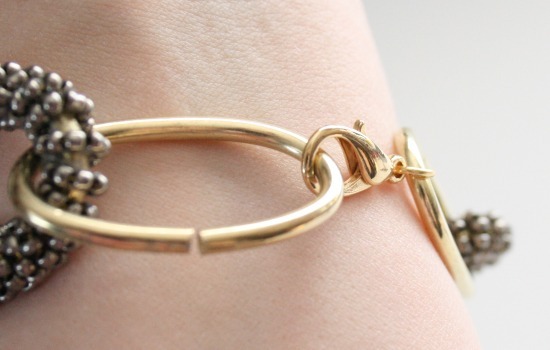 An added bonus is how incredibly cheap this bracelet is. I paid $0.33 for the chain, $1 for the seed beads (which I still have half left) and I had all of the findings already on hand. Less than a buck fifty? Yes, please! Next I’m going to make a long necklace to go with it. It will take considerably more time, but it will be worth it! Happy fun day Monday! What a clever way to jazz up some chain! 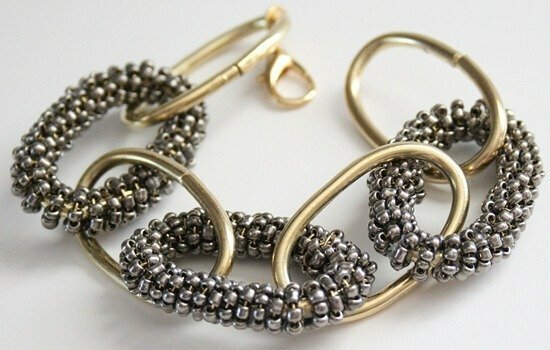 Ball chain (I've seen at my hardware store) would create a similar effect. What an incredibly clever idea! Looks really high class! I can imagine with a matching necklace it will be a head turner. Thanks for sharing it. I will definitely do one for myself. This is so creative and beautiful, I loved it!!! Ahhhhh I love this!! 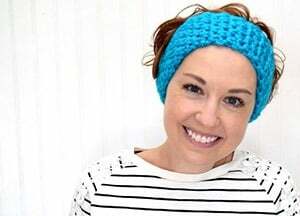 I don't usually adopt project ideas from other bloggers, but I'm really really considering doing this! !